Mailbag: Would a trade of Nick Foles to the Buccaneers make sense? 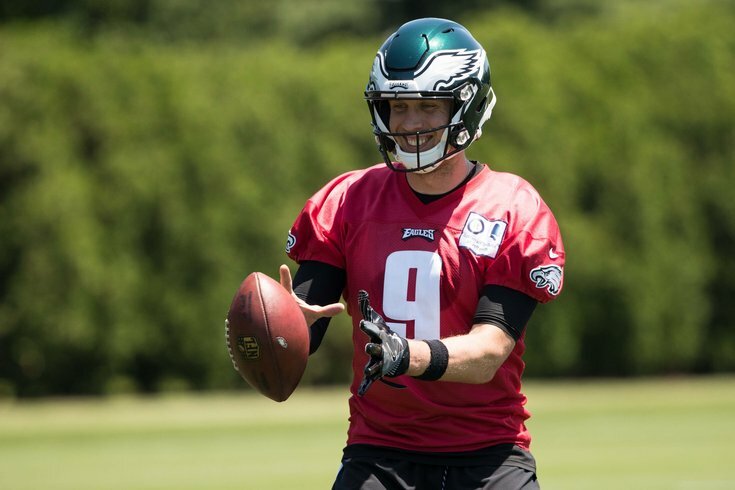 Nick Foles smiles as he makes a football levitate in mid-air. First of all, Happy Fourth of July. As a reminder, I love* you all. While I haven't had an Eagles chat in a little while during the deadest part of the NFL season, I have received a bunch of emails with questions about the Philadelphia Eagles. And so, let's answer a few of those here. Question from Dirk: I saw somewhere that the Buccaneers tried to sign Nick Foles in free agency, but he chose the Eagles instead. What do you think about the Eagles trading Foles to the Buccaneers, considering Jameis Winston's suspension? I hadn't seen that Tampa had interest in Foles during the 2017 offseason, but hey, after a quick Google search, you're right! That would certainly check off the "Do the Bucs even like Foles" box. However, for the Buccaneers to invest the type of draft pick capital it would require to land Foles (a first round pick in either 2019 or 2020? ), they would clearly be doing so to replace Winston, not acquire Foles AND keep Winston. That is something they are simply not going to do, as the team reportedly has "no plans" to release him, via Tom Pelissero of NFL Network. "My understanding was that barring some sort of 'out of left field' allegations that would have come up out of this report, we’re not expecting anything drastic here. The team has no plans to release Jameis Winston. They have stood by him publicly. Ownership and everyone else has voiced support overall for Jameis Winston. "Of course, whatever went into the incident is not anything that the team or anyone else would approve of, but in talking to people in Tampa over the past week you hear about the things that Jameis Winston does behind the scenes, things that he does in the community, the leader that he is for that football team, the guy that he is within the locker room, that is the player and person that they have been betting on Jameis Winston to be since they drafted him No. 1 overall despite the issues he had going back to Florida State." In April, the Buccaneers exercised Winston's fifth year option in 2019, which would amount to $20.922 million. However, the Buccaneers aren't necessarily on the hook for that money, yet. One important caveat to note is that the fifth year option does not become fully guaranteed until the first day of the new league year in the player's fifth year (in Winston's case, sometime in March of 2019). However, it is fully guaranteed for injury, as in, if, say, a player tore his ACL late in his fourth season, that fifth-year option would become fully guaranteed. The only real risk the fifth year option presents is if Winston plays poorly upon his return from suspension, and also sustains a serious injury during the 2018 season that would carry over into the beginning of 2019. Without the injury, the Buccaneers could simply release him prior to March of 2019, and would not be on the hook for the fifth year option at all. The Buccaneers are 22-42 since they hired GM Jason Licht in 2014. Licht made the decision to draft Winston No. 1 overall in 2015. He probably needs Winston to play well in 2018 and for the Bucs to show a significant upward trend to keep his job. "Betting on" Winston is the wrong way to describe the Bucs' decision to stick with Winston. It's more like they've hitched their wagon to a moron, and it's too late to turn back. If the Bucs have another poor season, Winston, Licht, and head coach Dirk Koetter could all be goners, but it appears they'll all get one final shot in 2018, with limited risk of being stuck with Winston's roughly $21 million in salary in a worst case scenario. In other words, the trade of Foles to Tampa is a long shot. Question from Don: I greatly enjoyed your, somewhat tongue-in-cheek, trashing of the NFC East. However I took note of your opinion of rushing in the NFL and wanted to comment. About a thousand years ago Bill Parcells was asked about his first priority when taking over a team. His response was 500 rushing attempts. Bill Walsh was also a proponent of rushing better than your opponent. If you look at 2017, two teams had 500+ attempts - both made the conference championships. Additionally, in terms of yards gained, 9 of top 10 teams made playoffs - only the Cowboys failed to cover their deficiencies with a run game. As Don rightfully points out, I criticized the both the Cowboys and the Giants for their strategy of building their offenses around the run game in my dumpster fire series. Also, Don's observation that most of the teams that have a high number of rushing attempts generally having success is an astute one. However, in many of those cases, it’s something of a “chicken or egg” scenario. By that I mean, are teams having success because they’re running the ball, or are they running the ball because they’re having success? In the case of the Eagles, they ran the ball a lot compared with the rest of the NFL because they were protecting a lot of second half leads. For example, they had huge leads in the second half of games against the Bears, Cardinals, 49ers, Broncos, and the Cowboys (first matchup). They got into their four minute offense in those games, and pounded the run to move the chains and kill clock. Conversely, they were down against the Seahawks in the second half, and Carson Wentz attempted 45 passes. Certainly, nobody would think of the Eagles or Patriots as run-heavy teams, strategically speaking. Now, there are definitely some successful teams that do build their offenses around the run. That can work for teams with top 5 types of defenses, like the Jaguars, Vikings, and Panthers. Obviously, it worked for half a decade with the Seahawks. The run-first approach can work for teams with great defenses, which is something the Cowboys and Giants don’t have. In the modern NFL, however, with all due respect to Bill Parcells, more often than not the really successful teams have excellent quarterbacks that can drive the success of the offense through the passing game, thus allowing the run to take over once they get the lead. Question from Phil (in regard to the Eagles' disinvite to the White House after most of the team planned not to attend): What would Jesus do? Not what the Eagles did. I am 68 years young and an Eagles fan forever. I have gotten many invitations over my lifetime from people I disagree with on many subjects. I have never RSVP'd and then did not show. Message to players -- grow up be the Christians you profess to be. God Bless all including the team I am disappointed in. To clear up any misinformation spread by the White House or whomever, the Eagles never RSVP'd saying that the entire team was going to show up. That simply didn't happen. As for your question, I don't want to speak for Jesus, but my guess is that Jesus would be cool with all the good that Eagles players do in the community. *I don't actually love you all. Just most of you.